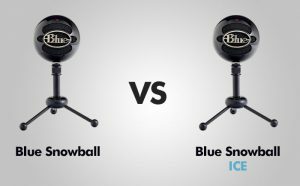 A few months ago, I created a post where I compared two microphones – Blue Snowball and Yeti to find out whether a much cheaper Snowball can be a good alternative to Yeti. This time, I would like to compare if even cheaper Snowball ICE can be considered as an option to already affordable Snowball. Both microphones are very similar when it comes to a design – they look like a … snowball, at least the white ones. They resemble an old-school vintage look with a big “Blue” logo at the front. At first it looks like metal, but in reality, it’s just a plastic. The mics come with a tripod that doesn’t require too much space, but at the same time the mic will fall over a lot, so be sure that you pushed its legs all way down and try not to knock it off. The tripod is equipped with the rubber grips in order to keep is secure and ensure that it will stay in place. The Snowball is available in six different colors: white, bright orange, brushed aluminum, electric blue, gloss black, neon green. And the Snowball ICE in two – black and white. The sound quality is very good in this price range. Probably better than any other microphone currently available on the market. It sounds good in the full range of frequencies. You don’t have to be very close to the microphones unless you speak very quietly, but if you talk normally, you can be between 3 and 7 inches. The sound quality is excellent and if you have a youtube channel this should be your choice. For someone who needs even better quality should choose Yeti. As I’ve said before, there is no difference when you look at them from the front, but turn them around and you will notice that the standard Snowball have an additional switch that ICE lacks. This switch is used to change polar patterns. 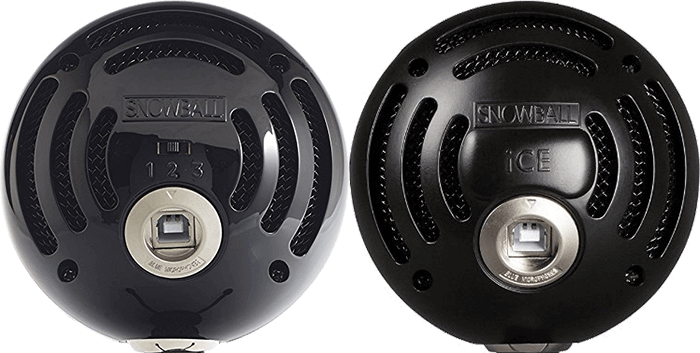 The Snowball ICE uses only one mode – the cardioid mode, so it doesn’t need any switch. Although you can use your microphone right away, there are some additional things that can be a good addition to your Snowball. When you speak toward your microphone, you often produce something called the “popping” sound. This is caused by an impact of fast-moving air. The pop filter will help you eliminate this problem. After placing your microphone on a hard surface, the sound can be distorted. The shock absorber connects with a microphone elastically, so vibrations won’t be a problem. Many people find useful the ability to maneuver a microphone. With this arm, you can do it with ease. PROS: Good sound quality / Decent build quality / Retro feel / Three audio settings / Metal stand / Light / Noise-cancellations. PROS: Good sound quality / Decent build quality / Retro feel / Metal stand / Light / Noise-cancellations. CONS: Microphone can be easily knocked down. CONS: One audio setting / Microphone can be easily knocked down. The difference in price between standard Snowball and Snowball ICE used to be $20. Today you can buy Snowball at almost the same price as ICE (for some colors). In this case, I don’t see why anyone should go with Snowball ICE.